Colin Kaepernick threw for 412 yards, three touchdowns and led his team to 34 points in the 49ers season opener against a true championship caliber Green Bay Packer team. Anquan Boldin managed over 200 yards receiving, and Vernon Davis caught two touchdowns. Seahawks fans remember seeing Frank Gore tear through the heart of their defense in the first match-up last season on the way to over 130 yards rushing. Ask any honest Seattle fan how they feel about the game this week, and they will admit to being at least a little worried. This 49ers team is tough on both sides of the ball, and will almost certainly be the most challenging opponent on the Seahawks schedule. What folks in Seattle may fail to realize is just how tough the Seahawks are on the 49ers. Yes, Seattle thrashed San Francisco 42-13 in the second game last year. 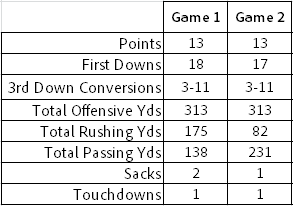 But what you might not know is the defense put forth a remarkably similar effort in game one. San Francisco sported a different quarterback, played in a different venue, and experienced a far different final score in game two versus game one against the Seahawks in 2012, but their offense looked nearly identical. The 49ers scored the same amount of points (13), had almost the same amount of first downs, had the identical 3rd down conversion numbers, identical total yards, and only scored a single touchdown both times. The most significant difference was the distribution of yards was more heavily skewed toward passing (231-82), where the 49ers ran for 175 yards in the first game. The rushing totals are always important in this match-up, as San Francisco is 4-0 when Gore eclipses 100 yards against the Seahawks, and only 3-5 when he fails to get there. Still, most Seattle fans memory of the first game last year was that San Francisco mashed the Seahawks, but the overall offensive picture does little to support that narrative. If I am a 49er fan, I am asking myself if Pete Carroll and the Seahawks defense have the 49ers figured out. 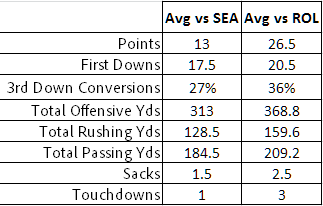 The disparity between how the 49ers offense produced against the rest of the league when compared to Seattle is remarkable. San Francisco averaged less than half their typical scoring output when facing the Seahawks. The passing game was less potent, and the running game was overall well below what the 49ers did to the rest of the league. This team averaged three touchdowns per game when playing a team not based in the Northwest, but only one against Seattle. These are significant differences, and the trend is not limited to just 2012. The 33-17 season opening loss to the 49ers in 2011 is not a fond memory for Seahawks fans. Would you be surprised to hear the Seahawks out-gained the 49ers in that game 219 yards to 209? Jim Harbaugh’s team had only 124 yards passing and 85 yards rushing. It took a 3-0 turnover differential and two Ted Ginn Jr. special teams touchdowns to come away with a victory. There is little doubt that the 49ers will test the Seahawks defensive line, hoping to find that weakness they exploited at times in the first game last season. Brandon Mebane must be the difference-making nose tackle we know him to be. Tony McDaniel has to introduce his brand of badass to that talented 49er line. Red Bryant must realize the promise his pre-season put forth. Vernon Davis will be a central part of the 49er game plan, but that is nothing new, and the results have been scary for San Francisco. Davis has averaged 2.5 catches for 32 yards and has not scored a touchdown against the Seahawks in the last two years. Boldin faced the Seahawks two years ago when he played the Ravens and was held to just two catches in nine targets. The one thing Boldin and Davis have in common is getting their soul bruised by Kam Chancellor in Century Link field. Even Michael Crabtree, a guy everyone considers a key to the San Francisco attack, would seemingly offer little additional confidence if he was playing. His best game against the Seahawks last year was 4 catches for 65 yards. He did not have a touchdown. But that is nothing new. He has yet to score a touchdown against the Seahawks in his career. Respect the 49ers. They are a fantastic team. Do not, though, be intimidated by them. They may be pit bulls, but the Seahawks defense appears to have them chained harmlessly to a tree. If the trend continues this Sunday, we may finally know who has it better than San Francisco.